The Shawshank Redemption, based on a short story by Stephen King, expresses the spiritual longing for freedom. In this instance, music represents Dufresne’s struggle to retain hope amid a corrupt prison culture. The movie borrows freely from a rich genre of prison narratives, which Christian writers have pioneered and bolstered for centuries. For some of Christianity’s most powerful teachers, including Fyodor Dostoyevsky, Alexander Solzhenitsyn, and John Bunyan, internment has been God’s agent for redemption and a stirring source of literary inspiration. The Russian czar’s guards dispatched Fyodor Dostoyevsky’s Siberia—bound sled on Christmas Eve, 1849. Earlier that year, he had been arrested for participating in a socialist discussion group, whose members desired to end serfdom in Russia. After awaiting their fate for more than eight months in a Saint Petersburg jail, they learned the bad news: They had been sentenced to death. But on December 22, at the last possible moment, a guard rode in with the urgent news of their reprieve. The execution had been staged—one last measure of psychological torture before the czar doomed them to years of hard labor in Siberia. This paradox crippled most political prisoners in the labor camps. Thrown together with petty thieves and hardened killers, intellectual dissidents often struggled to adapt to the merciless system imposed by their captors and aggravated by their fellow captives. Not long after he finally returned home in 1859, Dostoyevsky published a fictionalized account of his time in Siberia. But Memoirs from the House of the Dead briefly got him in trouble once more with the government. The czar’s censors deemed his novel’s depiction of Russian prisons to be too favorable. Given the novel’s content, it’s hard to imagine what would have appeased the government. House of the Dead ponders the prisoners’ pathetic attempts to exercise freedom despite restraints and repercussions. Even normal convicts who toiled in obscurity sometimes exploded in drunken, murderous frenzies. The story was all too common for Stalin’s Soviet Union. A devoted communist, decorated for his service in defense of Mother Russia, dares to question the paranoid despot and thereby becomes an enemy of the state he so loves. Alexander Solzhenitsyn suffered for eight years in the Russian gulags, whose conditions had improved only slightly in the century since Dostoyevsky languished there. As with Dostoyevsky, however, that which did not kill Solzhenitsyn made him immeasurably stronger. The trouble began while Solzhenitsyn was fighting on the front against Germany in the summer of 1943. Camped and awaiting battle, he met up with an old friend who shared his passion for communism’s utopian possibilities. Yet they also shared a Leninist critique of Stalin’s draconian style. Together they secretly composed “Resolution No. 1,” which compared Stalin’s communism to feudalism. In early 1945, Captain Solzhenitsyn was preparing his soldiers for their final assault on Berlin. But on February 9, he received an unexpected summons to brigade headquarters. With one telling question from the commanding officer—"Have you a friend on the first Ukrainian Front? "—Solzhenitsyn learned his fate. Soviet political operatives had seized “Resolution No. 1” from his friend and now charged him with conspiring to overthrow Stalin’s government. Three months later, while Muscovites danced in Red Square to celebrate the war’s end, Solzhenitsyn watched the fireworks from prison. The fall from Red Army officer to political captive had been crushing. Even life’s most basic pleasures—sleep, human contact—had been denied him. When he was transferred from solitary confinement to a cell with three other prisoners, his spirits soared. Solzhenitsyn was still far from being a Christian. Imprisonment had greatly tarnished his reverence for the Soviet Union he had once dreamed of commemorating in literature, but there remained serious anti-Christian dogmas to hurdle. He was a true child of the 1917 Revolution, torn from his family’s Orthodox faith and indoctrinated in dialectical materialism. By this time, Solzhenitsyn felt hunted by the Almighty. He recovered from cancer and embraced Christ. “When at the end of jail, on top of everything else, I was placed with cancer,” he recounted for biographer Joseph Pearce, “then I was fully cleansed and came back to deep awareness of God and a deep understanding of life.” Neither Solzhenitsyn nor the world would ever be the same. He was released from prison in 1953, the same year Stalin died. Nine years later, he published One Day in the Life of Ivan Denisovich, which miraculously cleared Soviet censors due to Nikita Khrushchev’s efforts to de-Stalinize Russia. This chilling novel, based on his gulag experience, exposed Russians and the world to everyday life as an enemy of Stalin’s communism. Along with The Gulag Archipelago, which incited the Soviet government to send him into exile, One Day dealt a crippling blow to communism’s credibility. And it wouldn’t have been possible without a resolute faith nourished inside the walls of Stalin’s prisons. Unlike Dostoyevsky and Solzhenitsyn, John Bunyan was thrown into prison precisely because of his Christian faith. twenty-one years old when forces loyal to the Puritans beheaded the deposed King Charles I in 1649, Bunyan suffered the sting of Anglican retribution in 1660. The mere act of meeting together became unlawful for “Nonconformists” like Bunyan under the restored King Charles II. And Bunyan was a prime target. Despite his humble “tinker” background and unordained leadership, Bunyan’s sermons attracted tremendous crowds. The government jailed him in 1660 when he refused to quit preaching in exchange for freedom. The separation from his family proved nearly unbearable. “The parting with my wife and poor children hath oft been to me in this place as the pulling the flesh from my bones,” Bunyan wrote in his autobiography, Grace Abounding to the Chief of Sinners. In 1672, after 12 long but beneficial years in prison, Bunyan was released thanks to the “Declaration of Religious Indulgence.” The declaration also enabled him to become the official pastor of his church. Tensions remained high, however, and he was again jailed, this time for six months, in 1677. Once again, what the authorities intended for evil, God used for good. During this prison stint, Bunyan authored The Pilgrim’s Progress. Born amid strife and sacrifice, The Pilgrim’s Progress gives a remarkably honest and rich allegorical account of the Christian life. In one memorable scene, Christian and Hopeful have been captured by Giant and are being held in his Doubting-Castle dungeon. “Now, a little before it was Day, good Christian, as one half amazed, brake out in this passionate speech: What a Fool, quoth he, am I, thus to lie in a stinking dungeon, when I may as well walk at liberty? I have a key in my bosom, called Promise, that will I am persuaded open any lock in Doubting-Castle. . . . Then Christian pulled it out of his bosom, and began to try at the dungeon door, whose bolt (as he turned the Key) gave back, and the door flew open with ease.” It is the same key to heavenly escape treasured for so many years by Bunyan himself, along with Dostoyevsky and Solzhenitsyn. For George MacDonald, belief in God and obedience to God went hand in hand. The stakes of the Investiture Controversy, were too high for peace between Emperor and Church. 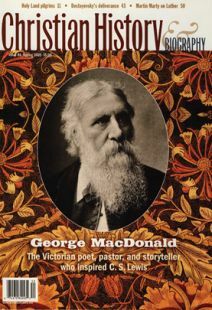 George MacDonald’s legacy is his reminder that we are creative beings because we are made in the image of a Creator.